I’m a little late posting this, but hey, busy weekend. So… There are many, many groundhogs out there. Several are consulted each February 2 on the prospects of an early spring. (Punxsutawny Phil is merely the most famous of these prognosticating rodents.) I wondered – how good are they? I mean, just so we’re on the same page here, a groundhog (or woodchuck, or whistle pig, or land beaver) is a squirrel. It’s a very big – the largest, actually – example of the squirrel family, and if you look closely you can see the family resemblance, particularly to Rocky Mountain marmots and prairie dogs. Like these cousins, they love to dig – they create very complex tunnel systems up to 45 feet long, and usually include a chamber specifically for use as an underground bathroom. They will make an alert call while standing on their hind legs, like a prairie dog (this is the source of their “whistle pig” nickname), but unlike their social cousins from the plains, groundhogs are mostly solitary, seeking each other out only to mate. Groundhogs are fairly prolific along the East Coast north of Charleston, throughout the midwest and across most of Canada. Within this range, they thrive as an “edge” species, preferring to live on the border between forest and meadow. Where I live, I know I can reliably spot them and their burrows at the local golf course (Caddyshack, anyone? ), but this preference also leads to lots of roadside burrows, and unfortunate vehicle encounters. Groundhogs are mostly herbivores, though occasionally they’ll eat a bug or two. They’re good swimmers, and though I’ve never seen one in a tree, apparently they can also climb (I told you they’re squirrels!) to evade predators if they’re unlucky enough to get caught too far from their dens. They mate in the spring and have 2-4 babies, called “kits”, which I have seen, often, and which are absolutely adorable. 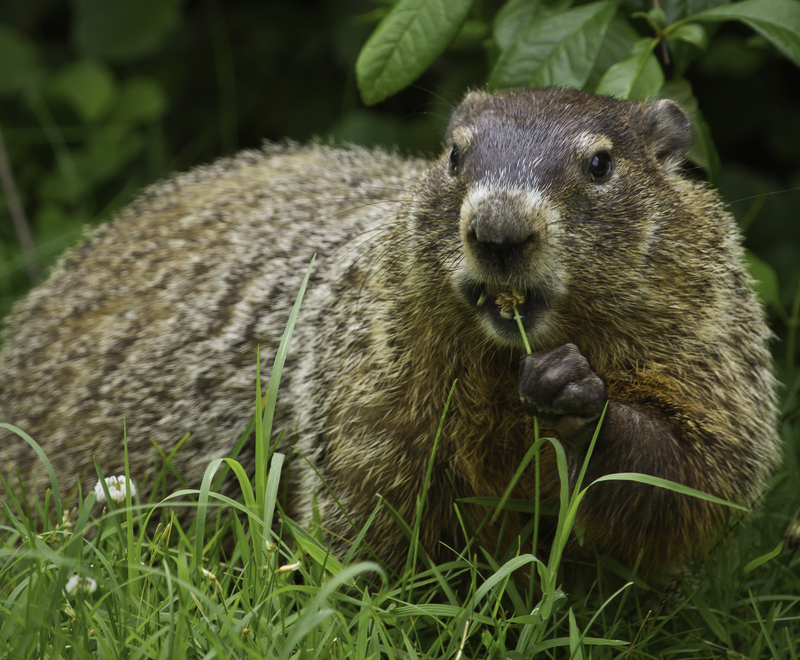 Most importantly, though, from the standpoint of weather prediction – groundhogs are true hibernators. They bed down in their burrows in late fall and almost completely shut down until spring – heart rates slow down to 5 beats-per-minute, core temperature drops into the 40’s-Farenheit (normal temperature is about 99 degrees, much like ours). We’re talking deep suspended animation here. So, on one hand, it would be very disruptive to actually rouse a groundhog in the middle of the winter to ask what it thinks. On the other, you would expect a creature whose biochemistry changes for an entire season to be pretty attuned to when that season is going to end. (I’m carefully sidestepping the fact that shadow-casting is the method for groundhog weather-guessing, and that Phil and his ilk are just furry stand-ins for a… well, any old stick or anything else that could cast a shadow). It seems that badgers are actually the original weather-casters. The tradition is actually tied to Candlemas, when Feb 2 was marked for a very different reason, but western Europeans had a tradition about using the weather that day to predict the remainder of winter. Germans apparently tied this tradition to badgers peeping out of their dens. German immigrants to the eastern United States (Pennsylvania in particular), couldn’t find any badgers, but saw lots of groundhogs, and so a new tradition was born. Statistically, I find mixed results. Most studies suggest groundhogs are poor stand-ins for badgers (or again, sunlight on this day isn’t a good indicator), and that Phil, in particular has only been right about a third of the time. This is bad, worse that a coin flip. In fact, this analysis from Indiana University suggests that Phil is much worse than random chance, and so bad that it would appear he’s actually biased toward getting it wrong. He’s either trying to keep us humans on our toes, or just ticked at having been awakened to be asked a very stupid question. However, this Pennsylvania source claims that when you focus on temperature relative to the freezing point, and focus on Pennsylvania, which is what Phil should know most about, he’s actually right roughly 2/3 of the time – which would make him a decent meteorologist, considering he’s not got much data to work with. I tend to think these Pennsylvanians are biased! As an interesting side note, it is statistically rare that Phil sees no shadow and predicts an early spring. For the record, that’s what happened this year – but don’t make any vacation plans based on his guess, particularly if you live outside Pennsylvania. He’s just an adorably big, whistling ground squirrel, after all – and he might even be irritated about waking up from a long winter’s nap. Cut him some slack. As usual, people have it wrong, not Phil. People assume that Phil is frightened by his shadow. I think Phil is pleased by seeing his shadow and goes back in his burrow to catch a short nap before Spring when the chores of life begins. Not unlike the snooze button on an alarm clock. That’s a great take! And not unlike that of the Punxsutawney folks who rose him every year. They say that Phil is always 100% correct and his interpreters often get it wrong!